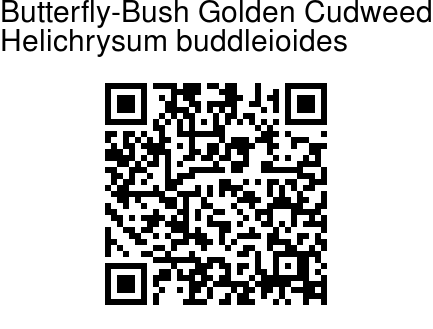 Butterfly-Bush Golden Cudweed is a shrub or undershrub, up to 4 m tall, sometimes scrambling; stems greyish white woolly. Leaves are ovate-lanceshaped or oblong-oblanceoate, base nearly stem-clasping, pointed-tapering or blunt and sometimes hooked at tip, margins recurved, 1-7 x 0.5-2 cm, upper surface hairless or sparsely woolly hairy, lower surface with dense white or cottony tomentum, 3-7 nerved. Flower-heads are borne in dense corymbs at branch-ends, in spherical clusters, 2-2.5 mm across. Flower-cluster-stalks are very small, 0.2-1 mm long, densely woolly woolly. Involucral bracts are yellow-pale yellow, 4-many-seriate, enveloped in woolly tomentum; outer obovate, brown at base; inner inverted-lanceshaped, brown at basal end. Ray florets female, with thread-like flower, 1 - 2.5 mm long, obscurely or 4 toothed. nisc florets bisexual, with flower 1 - 2 mm long, 5-toothed. Achenes about 0.3 mm long. Pappus hairs are white. 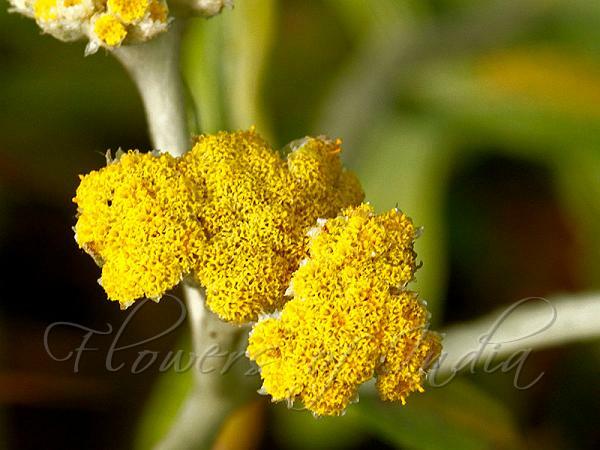 Butterfly-Bush Golden Cudweed is found on Deccan Plateau, up to 2500 m elevation, in Tamil Nadu and Karnataka, and Sri Lanka. Flowering: March.